William Ely Hill was born in Binghamton, New York, on January 19, 1887, according to his World War I and II draft cards, and a 1918 passport application (see photo). Ely was his mother’s maiden name. William Ely Hill (Last address) New York, N.Y. Born Binghamton, N.Y., Jan. 19, 1887. Edu. Amherst, B.A. Originator “Among Us Mortals” and other cartoon series. Cartoonist. Initiated Oct. 24, 1905. The artist referred to is William Ely Hill, who up to nine years ago was a resident of Binghamton. For the theater periodical, Green Book Magazine, Hill provided cartoons for the July 1914 and August 1914 issues. 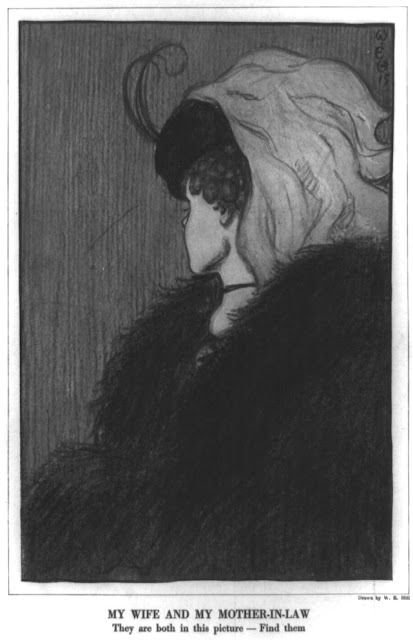 Hill’s drawing, “My Wife and My Mother-in-Law”, appeared in Puck, November 6, 1915. The drawing has been reprinted in many psychology books. My Wife and My Mother-in-Law. They are both in this picture—find them. 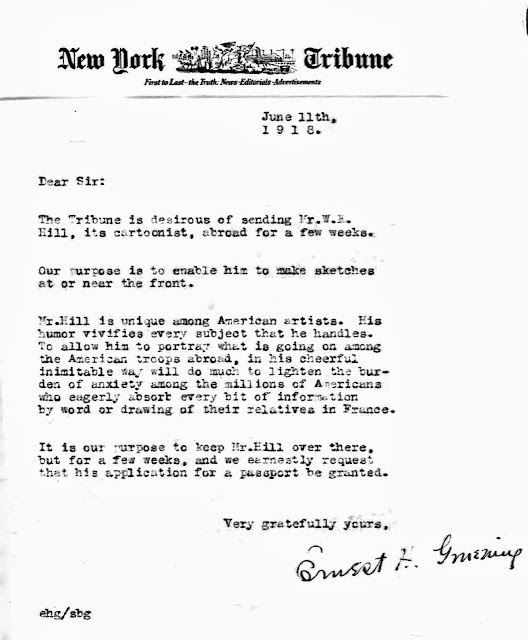 In April 1916 Hill began a long association with the New York Tribune which lasted through 1922; his first work, a strip, appeared April 9, and the second, a half-page, on the 16th. His series of full-page drawings, with various descriptive titles, ran in the magazine section from April 23 1916 to February 4, 1917. The series title, Among Us Mortals, began February 11, 1917, and was dropped February 5, 1922. The series ended in the New York Tribune December 31, 1922. 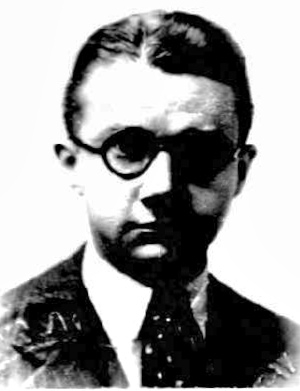 Among Us Mortals had been running in the Chicago Tribune since February 5, 1922. Picking types from the everyday folks he sees on the streets, or wherever people gather, Mr. Hill satirizes in a genial way, little weaknesses that are common to mankind. The freshness and novelty of his work, and its artistic merit him given “Among Us Mortals” a front place as a newspaper feature. Mr. Hill is a son of Mr. and Mrs. W.S. Hill of New York, formerly of this city, and is a nephew of Mrs. C.W. Sears. “William E. Hill, whose speaking likenesses of everyday people appear in The Sunday Times under the caption of ‘Among Us Mortals,’ came to Washington today. “Some weeks ago Mr. Hill drew a picture of men and women rehearsing for a burlesque show and had the audacity to call the burlesquers’ life ‘vain and hollow.’ All sorts of complications arose the burlesquers at a local playhouse rising in righteous wrath and offering to bet all kinds of money that they received more pay than Mr. Hill. “He said he intended roaming over Washington and making sketches of people in various walks of life here. The National Capital, he said, offered such a prolific field for sketches of so many and varied types of men, women and children that he anticipated difficulty in exhausting all the subjects here before laying down his charcoal and closing his artistic career. “Practically no one who sees Mr. Hill without being introduced to him would guess for an instant that this modest and retiring young man is the creator of the most human and true life sketches every [sic] printed in America. Mr. Hill pictures people at work, at play, on their way to work, at home, at meals, or on picnics. He doesn’t try to make any one handsome who is not handsome, and men and women wearing eyeglasses appear frequently in his sketches, not because he wears them himself and likes to draw them but because he finds these people wherever he goes to faithfully and truly reproduce what he sees. No Need to Imagine Types. “ ‘I learned very early in my career as an artist that if you stick pretty close to the people you see about you, every day you need not draw on your imagination for types,’ said Mr. Hill. “ ‘People, just plain, everyday, commonplace people, alive and in motion fascinate me far more than anything else in the world.” he continued. “ ‘They look and dress, and do everything that they could be imagined doing, and they are everywhere that there is anywhere to be. “ ‘When I made my first sketch of people as I really found them, I had no idea of keeping it up. That was simply one day’s work. I remember the first sketch very distinctly. It was made only a year and a half ago and was a few glimpses at the Easter parade in New York City. “ ‘When that was printed it suggested another sketch of human life as it is and every sketch suggests a great many others. Human nature is an exhaustible subject and a man might draw types of men, women and children for a hundred years and still not scratch the surface of his subject. “ ‘I have come to Washington because life here is very different from anywhere else in the United States and types are to he found here which could not be found in any other city in the country. “ ‘The vast army of Government employes rushing to their work, the crowds fighting to get on already overcrowded street cars, the blank look on the voteless inhabitants of the city, the rich and the poor, the humble and the great mingling together on your streets, the omnipresent soldier, sailor and marine; the children of the rich playing in the parks, the visitors at the Capitol, the tourists, the scenes at markets, al1 hold a tremendous interest for me and doubtless would for any one coming to Washington for the first time. A book version of Among Us Mortals was published in November 1917. The preface tells the story of the series’ beginning. Hill signed his World War I draft card June 5, 1917. He resided at 2350 Broadway in Manhattan and was cartoonist for the New York Tribune. His description was tall height, slender build, with blue eyes and brown hair. On June 24, 1918 he applied for a passport to gather “material for sketches” in England and France. The application included a letter from the Tribune. According to the 1920 census, newspaper cartoonist Hill and his parents resided in Brooklyn at 95–97 Columbia Heights. His father passed away in 1928 and his mother in 1930. Hill was among the scores of artists and writers who signed the Greenwich Village Bookshop door. In 1926 Hill’s Among Us Cats was published by Harper and Brothers. Hill has not yet been found in the 1930 census. The 1940 census recorded him in Redding Center, Connecticut; he moved from New York City after 1935. Hill’s World War II draft card was signed April 27, 1942. He resided in Redding, Connecticut. His employer was the Chicago Tribune-New York News Syndicate, and his description was five feet seven inches, 150 pounds, with brown eyes and gray hair. A 1949 issue of Editor & Publisher profiled Hill. Hill passed away December 9, 1962, in Connecticut. His death was reported two days later in the Binghamton Press which said Hill was to be buried at the Spring Forest Cemetery, in Binghamton, on December 12. The Wilton Bulletin said he died at the Danbury Hospital. In the category of the weird, Hill's supposedly 1930s work Life Sketches had some of the Sunday's reprinted in Print Mint's Arcade (1975 series) #2 (Summer 1975).